The British Gazette » Discombobulation: Delusions of drama. 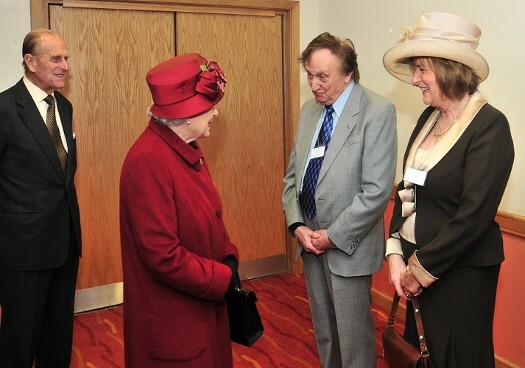 Above Sir Kenneth Arthur Dodd OBE and Lady Dodd meeting HM The Queen and HRH The Duke of Edinburgh. Ken Dodd was one of the UK’s best loved comedians, singers and occasional actors. He was described as “the last great music hall entertainer”. One of the shows Ken Dodd is best remembered for is appearing on “The Good Old Days” filmed at the City Varieties Music Hall just off the Headrow on Swan St, Leeds in the West Riding of Yorkshire. For local folk to be part of the “studio” audience in the ornate, restored 19th-century music hall was a great occasion for everybody had to get dressed up in 19th Century fancy dress. The word “discombobulate” is a whimsical 19th Century American English word meaning to to throw into confusion. It was no accident that the age profiles of the Leave voters and the Remain voters differed radically. Most people who voted between the ages of 18 and 24 voted to Remain. Most people over 60 voted to Leave. However, what swung it for Leave was that the majority of the 18-24 group did not actually bother to vote, whereas the majority of the 60+ group did. Now those running each campaign were fully aware of this tendency beforehand and those in the Remain campaign sought to counteract this. Their efforts however were unsuccessful. Since then, those who voted (Leave and Remain) have been treated to the most extraordinary spectacle. This is of a government, the opposition parties and the mainstream media acting in a deluded manner. Individuals seem to have “lost the plot”. Never a truer set of words were spoken! Indeed, in their seminal work, “The Great Deception”, Doctor Richard North and Mr Christopher Booker have described in authoritative detail the massive deceit that was practised not only on the British People but the peoples of Western Europe by those of the European elite who planned to create what has since become the European Union. Since New Year’s Day 1973 the European Community became the European Economic Community and then the European Union. The member states of the European Union (after November 1993) became members of the European Economic Area (EEA) on New Year’s Day 1994. The other three member states of the EEA were the European Free Trade Area (EFTA) states of Iceland, Liechtenstein and Norway. The fourth EFTA member Switzerland, has made bilateral treaties with the EU. By the time the voters went to the polls on Thursday 23rd June 2016, the UK had been part of the EC/EEC/EU 43 years, 5 months and 23 days. Over that time there had been a steady transfer of administrative, governmental and regulatory competences from the member states to Brussels. Thus, the UK on Thursday 23rd June 2016 was governed in a very different manner and had very different trading relationships than the UK on New Year’s Day 1973. One cannot simply abandon all these arrangements that have been put in place. Madame Mayhem however appears to have lost this plot. We can only conclude that she is delusional or that she is awaiting upon “events”. These events will be calls that will be enacted for a second referendum which will reverse the decision of the vote on 23rd June 2016. This will probably be precipitated by a market driven financial event – a crash in the value of the FTSE250, a run on Sterling and a substantial de-rating of the UK’s credit rating. A second referendum which reverses the Brexit vote will be accompanied by a corresponding increase in the FTSE250, Sterling. However a re-rating upwards will be delayed.